Home // Blog » Soup as a Snack? Can soup be a snack? For gastric sleeve patients it sure can be. Incorporating your vegetables (and protein) into a snack that is warm and soothing can be very satisfying. For many, eating raw vegetables doesn’t make snack time very satisfying. But by cooking them and adding low calorie broth, it can make the vegetables much more palatable. This recipe it’s also a good way to get the nutritional benefits of ginger, mushrooms, and spinach. Ginger is renowned for soothing stomach ailments, but it’s also an anti inflammatory. Spinach is rich in vitamins A and C, as well as fiber, and a host of other vitamins and minerals. 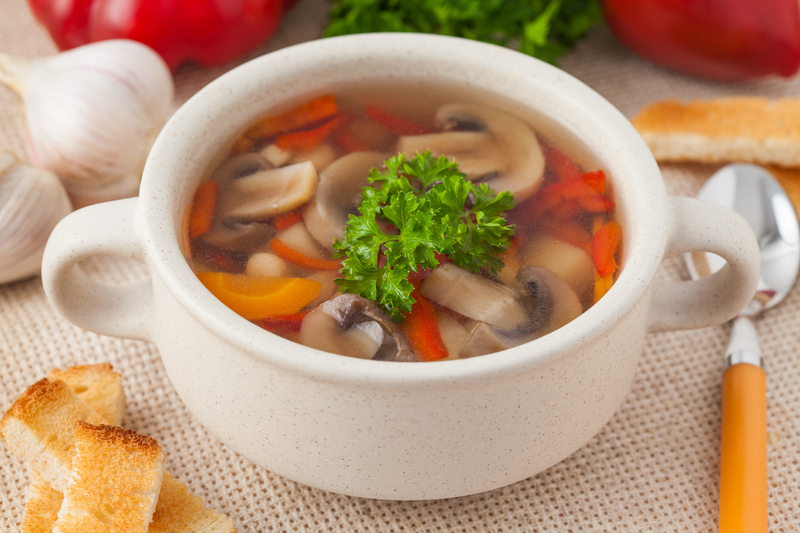 Mushrooms are also a good source of fiber, so the soup can help you feel fuller for longer. By adding in pieces of chicken, the amount of protein provided can help you meet your daily protein needs after gastric sleeve surgery, which is a feat many weight loss patients struggle with. Eating a diet higher in protein and lower in carbohydrates and calories is a cornerstone of the post bariatric surgery diet, which helps gastric sleeve patients achieve the weight loss success they seek after bariatric surgery. Bring the chicken broth to a boil, add the ginger root and simmer for 15 minutes to infuse. Remove the ginger root using a slotted spoon. Add the mushrooms and cooked minced chicken to the ginger infused broth. Simmer for 1-2 minutes. Add the spinach ribbons and cook another 1-2 minutes. Serve immediately, and reserve the leftovers in the refrigerator for another snack time. The above recipe suggestion is offered by Dr. Shillingford, MD, PA, a board certified surgeon specializing in advanced laparoscopic and bariatric surgery. Dr. Shillingford is well known in South Florida for his surgical expertise, including using robotics, as well as his compassionate bedside manner. Dr. Shillingford’s gastric sleeve patients come from all over Florida, including Boca Raton, Fort Lauderdale, Miami, Orlando, Port Saint Lucie, and Jacksonville. Dr. Shillingford takes great pride in helping his patients improve their lives and their health.